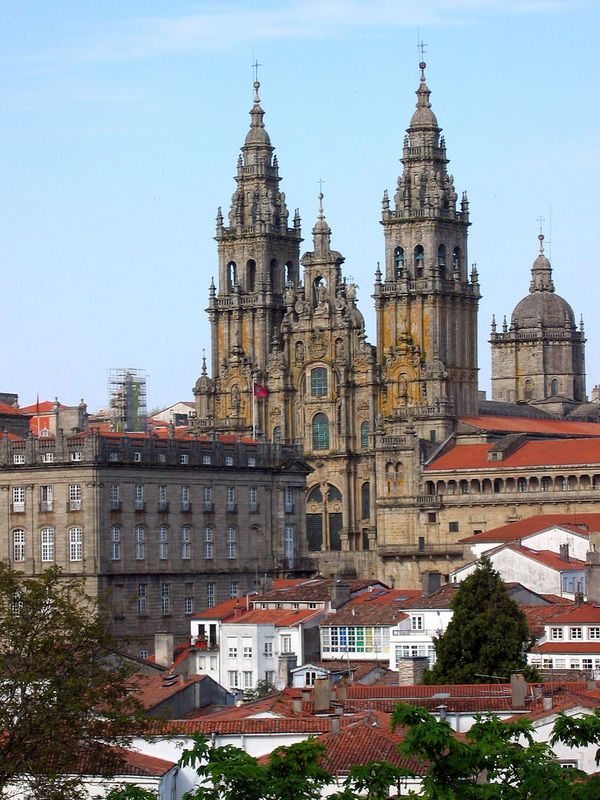 The Cathedral of St. James, overlooking Santiago de Compostela, Spain. At the heart of our Christian spirituality is the belief that we are a pilgrim people. From birth to death our lives are marked by rites of passage leading us to the day when we hope to enter into the new and eternal Jerusalem. We are on a constant journey of transformation, of living, dying and rising again with Christ until that day when we are one with God and the whole communion of saints. Unfortunately, I suspect that in the chaos and rush of our daily lives, guided by our diaries and schedules, we forget that there is a much larger purpose to what we are about. That we are pilgrims on a journey, yearning to become fully alive as God wants us to be. Throughout Christian history, women and men have sought to tangibly experience their pilgrimage of faith by walking long journeys to great shrines across Europe and the Middle East. Many of us may even know of these stories from reading such books as The Canterbury Tales. In fact, some of the greatest works of Christian spirituality have been borne out of people’s pilgrimages, such as the Russian classic Way of the Pilgrim. Pilgrimages have even been the focus of contemporary films. One such movie, The Way tells the story of a father who walks, in his son’s place, the world-renowned pilgrimage “The Way of St. James,” a journey that has its beginnings in various parts of Europe and ends in the city of Santiago de Compostela, Spain, the place where the Apostle James’ remains are kept. Often referred to by its Spanish name, El Camino – The Way, the walk leads pilgrims along paths journeyed by women and men over hundreds of years. For many — religious, spiritual and secular alike — the trip is deeply transformative. It is no wonder that El Camino breaks open the hearts of so many women and men. As embodied spirits, our spirituality often awakes from its slumber when our bodies must physically enter the journey of faith. It is fitting to remember this today as we celebrate the feast of St. James, the saint who inspires so many people to walk in faith to his shrine. While many of us may never be able to walk El Camino or many of the other Christian pilgrim routes, we can make our own pilgrimages at home. It was once common for Catholics to visit various churches in their city, or region, on Good Friday. Perhaps you and your family can set a day or two to make your own visits to churches and shrines around Canada. Or you can spend a day hiking and dedicate the time to prayer and reflection. Whatever you do, allow yourself the time to slowly walk in silence, and let your ears listen to the whispers of God. You never know what you may discover. For more information about walking The Way of St. James, check out Every Pilgrim’s Guide to Walking to Santiago de Compostela published by SCM-Canterbury Press and distributed by Novalis.